One of our manufacturing processes known as chemical etching can produce a precise, high-quality design that will be durable. If you are unfamiliar with this manufacturing technique, here are some of its advantages. Chemical etching is an exceptionally cost-effective procedure. Because this method makes use of chemicals to produce the design, there is no need for extensive machine setups or the use of complex tools. You can produce many parts at once without the use of a stamper, molding press, or dies, all of which are costly. These tools are more than a one-time cost; they will require maintenance, which also means substantially more labor costs. This method is an eco-friendly procedure. With increased pressure for businesses to be more friendly to the environment, chemical etching is gradually becoming a more widely used procedure. In recent years, more eco-friendly chemicals are being used for etching, one of the most notable being ferric chloride. When this is mixed with water, the resulting product used to do the etching is so environmentally safe that it is also used to process drinking water. The process puts virtually no stress on the material. As opposed to procedures such as stamping, chemical etching does not put any mechanical stress on the product. The lack of physical deformation also results in the final part having no burrs. Anything that is subtracted from the substrate is cleared away with the etching solution. You can alter the design if necessary on short notice. Due to the fact that chemical etching uses no machine tools or dies, if there is any fault in your design, or your preferences change, it can be quickly changed. When tool settings do not have to be altered, and no new die has to be ordered, manufactured, and delivered, the necessary adjustments can be made saving both time and cost. 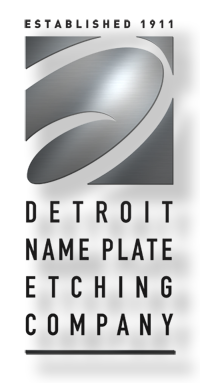 To further inquire about chemical etching, or with any other of our procedures, please Contact Us. Thank you.